Peril Unlimited is a little company, and that's an understatement. It's a one man show, similar to the old Vaudeville musicians that played 20 instruments at one time with various parts of his body. They released the figure Ash, their first zombie, almost one year ago now. They're second zombie is now ready to ship, and she's a beaut - Bloody Betty! We don't get many female zombies, and this one is an unfortunate cheerleader. Or she was before joining the undead. Talk about ugly Betty! You can pick this lovely lass up for around $35 - $40, depending on the retailer. You can get her from Peril directly, or you can hit one of the sponsors I have listed in the Where To Buy section. Betty is a limited run, but I don't have the word back yet on what the final production size was. Peril themselves are selling 250 of the regular and 250 of the bloody, and since the bloody versions are all hand distressed, you can bet there aren't tons more. I love the packaging concept for these figures. Of course, they had to come up with something cheap and simple, but they wanted it to still be cool. The solution? A body bag from the morge! How much better could that be? The first time though, you had to cut the body bag open yourself to free the figure. This time it comes with a slit already in the back, making it less likely that you'll mess up your nifty bag. The bag comes from the Red Hook morgue this time, as noted in lettering on the front. Eventually I hope they can afford to add a zipper, but until that time I'm quite content with the package as it is. 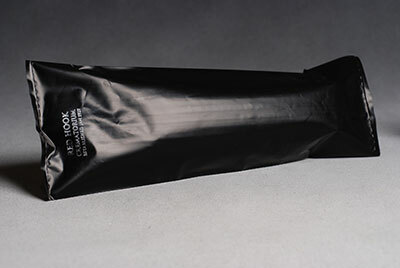 The body bag will come shipped to you in a white box - simple but elegant. Some zombies show more or less damage. It all depends on a) how much damage they sustained in dying a b) how much time they spent decomposing before rising from the dead. In Betty's case, it looks like she was a risen zombie, someone who'd been rotting in the ground for awhile, rather than an early victim of the putrid risen zombies. This is because the damage to her face and head is quite extensive, with no skin remaining on her face and her rooted hair quite intentionally patchy. This damage looks a lot more like rot than damage. Of course, you might wonder how she ended up buried in her cheerleader outfit, but stranger things have happened. The head sculpt is quite gruesome, maybe even a little too much. Because of the expose meat and bone, she looks much older, having lost any youthful appearance. It's a little incongruent with the cheerleader look, but then, zombies aren't exactly fashion models. The detailing on the bloody, torn face is excellent, with a very realistic appearance to the rot. The rooted hair works perfectly here, because the patchiness is actually supposed to look that way, and the thinness allows the hair to flow more naturally, with less problems with frizz. The hands are unique sculpts this time, another change since Ash. Peril is working to improve with each release, a very positive idea that more companies should adopt. The hands look appropriately twisted and lethal, but there is something wonky going on with the thumb of her right hand. It looks a lot like another finger, making the hand looking very odd. One of the coolest aspects of Peril's Zombies is that you can get them one of two ways - gory or clean. The clean version has the proper bloody mess for a face and hands of course, but the additional blood on the costume, and any damage to the material, is added by hand by the owner of Peril Unlimited himself. It's you're own custom zombie! As you can see, mine is one of the gory versions, with damage added by Peril. What you get when you go with the bloody version will vary of course, but I'm extremely happy with the appearance of mine. There's some of that dirt in the paint, like in the first release, Ash, and this works extremely well again. The blood on her clothing appears to be that of a victim, and is splattered in all the right places. There is a black spot on the left eye, that looks like it came from the work on adding the blood. That's the only nit I have to really pick with the paint job overall. Of course, the factory work is quite clean. The hamburger face looks good, with varying colors used for the skin, skull and exposed muscles. This was the one score I waffled around a bit on. She has all the articulation you really need for a zombie I suppose, with the usual sixth scale joints all there including cut thighs, a ball jointed neck, pin and post wrists, and a good pivot chest joint. Some of the joints are also the clicky variety, particularly the hips, which means she'll hold the poses quite well for long stretches of time. There were still some things I wanted do with her that I couldn't quite manage though (stop that! She's a zombie for God's sake! ), especially with the neck and ankles. The neck needs a little better range of movement as do the ankles, if you want to give her that truly 'broken' look that zombie so often have in their stances. Nope, the dear girl doesn't have any pom poms. Not that kind, anyway. The outfit you see in my photos is not the final version, and the figure you get should have two noticeable changes. One of those two changes would help boost this score. The less critical change, but a good one nonetheless, is the shoe color. They will be blue in the final version, to better match the blue of the cheerleader uniform. Not a big change, but a sensible one. The other change is much more critical. You will notice in the photos that her sleeves are too short, exposing the wrist joints. The final version will have longer sleeves, covering these joints, and that would boost my score. Of course, I can only score based on what I have in my hand, so that's where my *** stars come in, but with hidden wrists, she could easily slip up another half star. The cheerleader uniform is made from a very heavy duty material that should allow for quite a bit of damage to be added at your discretion. The thigh highs look good, and while the shoes are a little oversized, it's not a major issue. As with the paint, the gory version has been customized by Peril. The dress is distressed in several areas, and the thigh highs are even torn and damaged. Every figure is going to be different, since this work is done by hand. You can buy this figure for under $40. This is a low run, high touch manufacture, well articulated, nicely sculpted and painted sixth scale action figure, for under $40. That's impressive in the market, and even more so when you consider the low run size and the fact that the bloody, gory version has been hand painted and distressed! And if you want just the regular clean version to bloody up yourself, you can get her for just $30 - that's a damn good deal. The downside of the cool dirt paint job is that repeated handling tends to wear it off. Don't play with her any more than necessary. Another great job from Peril. Considering that it's pretty much a one man operation, with lots of attention and detail work on every figure, it's pretty damn impressive. I would like to see some accessories with future releases (how cool would it have been to get a bloody leg, wearing cleats and the remains of a football uniform, with Betty? ), but I realize that this is where Peril has decided to cut back, to avoid higher costs from such a small run of figures. Still, in future releases, I hope that the run sizes get big enough to allow them to add some goodies. If you're a fan of zombies, and are looking to add to your Sideshow collection of The Dead, look no further than the Peril figures. They'll fit in perfectly, and add another dimension to the ever growing ranks of the undead. Braaaaaiiinnnnssss! - Alter Ego Comics has her at just $36. - Dark Shadow Collectibles will be carrying her, but doesn't have her listed yet. - you can get her directly from Peril at there website or their ebay store. The bloody customized version is just $40, or the regular, clean version is just $30. - or you can search ebay using MyAuctionLinks. - Ash, the regular zombie. - and if you like sixth scale zombies, look at Sideshow's The Dead line. I reviewed their Security Guard awhile back. - there's also the cool figures from the Dust series. - there's my review of Cult Classics 4 that included the plaid shirt zombie from Dawn of the Dead and the zombie fighter Shaun from Shaun of the Dead; and the Cult Classics 3 Flyboy Zombie from Night of the Living Dead. 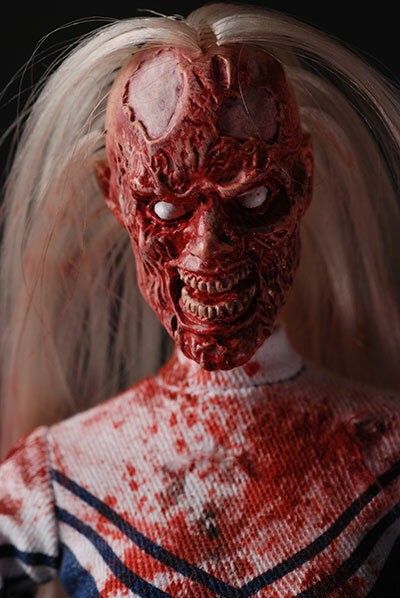 - then there's my review of Earl, from Mezco's line Attack of the Living Dead. - check out the Marvel Legends monster boxed set that included the zombie from Tales of the Zombie. - SOTA recently released the Land of the Dead figures.